Political philosopher Richard Rorty’s influence on contemporary thought has increased in tandem with the controversy his outspoken views have provoked. His rejection of the grand, metaphysical questions of traditional philosophy has made him the most prominent living thinker in social and political theory. By declaring himself a pragmatist Rorty has attempted to shift the direction of modern philosophy toward the question of how to achieve a better, more humane, and more tolerant society. Redescription—a process through which we invent novel, attractive depictions of our current social situation as well as our future options—is the name that Rorty has given the means to achieve this goal. 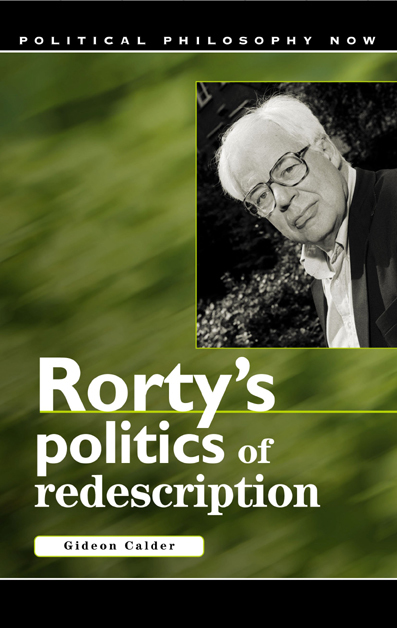 In Rorty’s Politics of Redescription, Gideon Calder scrutinizes Rorty’s writings in order to tease out their wider political and social implications, while also giving us an evaluation of Rorty’s entire body of work. Calder attempts to draw out inconsistencies in Rorty’s work by identifying where he has failed to escape the modern philosophical agenda that he opposes, and his astute appraisal will engross anyone interested in Rorty or philosophy’s impact on politics.